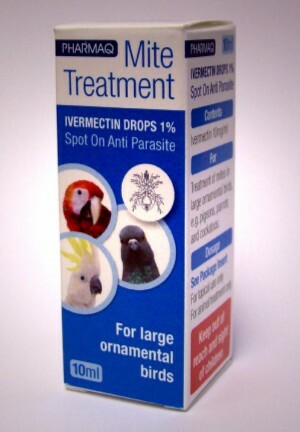 Animal Medication Direct :: Bird Products :: Ivermectin Spot-On Drops 1%. (Pharmaq Brand) 10ml. Ivermectin Spot-On Drops 1%. (Pharmaq Brand) 10ml. For non-food animals. Controls and treats mites in large cage birds e.g. parrots and homing pigeons. Apply the appropriate dose (one drop per 500g body weight) on the back of the neck, between the shoulder blades once per week for three weeks. More product information can be found by clicking here.